Oh I don’t believe it! Remnants of winter in my pantry, a lone butternut squash leans quietly at the very back of my sack of rice and onions. A sneaky one. Pacing to and fro the fridge and cupboard, I realized that I also have a lot of unused curry powder from Malaysia too. I’ve been making my own curry spice when I needed some. I bet that pile of pre-packed curry powder have been feeling rather lonely too. That lone butternut squash will be good for a vegetarian squash curry. On a bed of rice. With a cold lemony slaw. 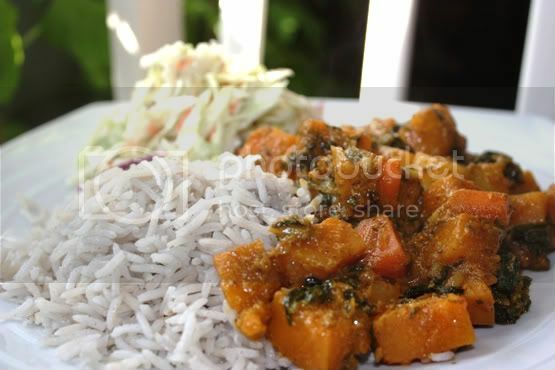 I don’t know about you but curried squash can be so delicious and yet so simple. I toasted some spices to go with the packet curry powder from Malaysia. I like my curries to pack a nice aroma with a spicy punch. 1. 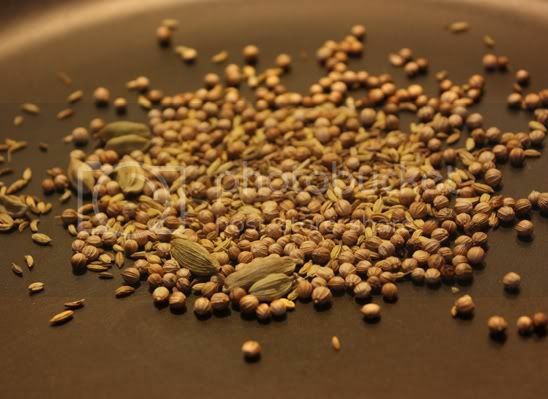 Toast the coriander seeds, cumin, caraway and cardamom until aromatic. Be mindful as to not burn the spices. 2. 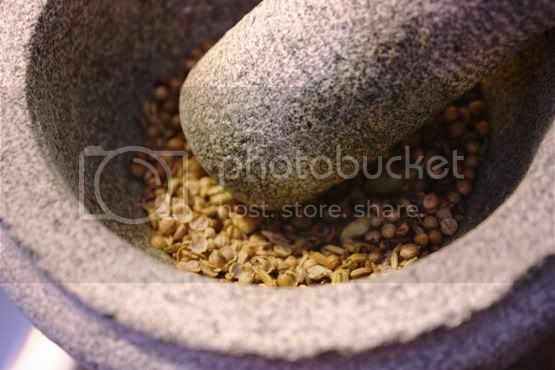 Pound the toasted spices in a mortar and pestle until all the spices are crushed. 3. In a same pan, heat oil and toss in the mustard seeds and star anise. When the mustard seeds starts popping, add the onions and garlic in. Saute until the onion is translucent. 4. Now, add the pounded spices and dried chili in. Saute for a minute or two and then add the squash and carrots. Season with salt and pepper. Cook the vegetables for approximately 8 minutes or until the squash is slightly opaque on its sides. 5. Add the curry powder and turmeric powder in and saute to combine well. Pour the yogurt in with the spinach and cook for another 10 minutes. Serve the curry hot a bed of basmati rice and a side of lemony slaw (recipe below). 1. Mix the lemon juice, mayonnaise, chili flakes, salt and pepper in a bowl until well combine. 2. Pour the dressing over the salad and toss to combine. Chill before serving. Yum, this looks delish! I have never attempted to make my own curry powder…although I do own several mortar and pistols! katie: You should try it, you get more control on what type of spice you want in it and how spicy you want it to be. 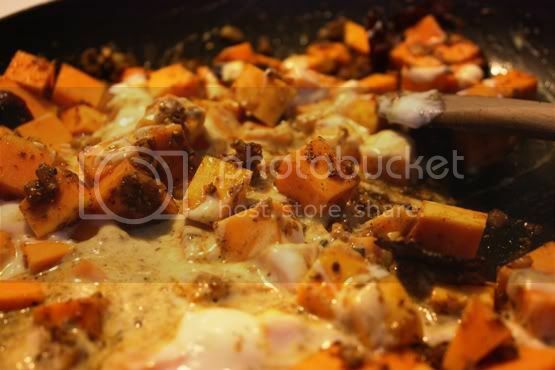 This curried squash sounds really good! I like the use of the yogurt in it.